Tipping is very prevalent in service establishments in New York. It began as just a way of rewarding exceptional service, but it has now become an expectation. Tipping is by no means required by law, but it is embarrassing not to tip in New York. Just like in other countries, where tipping is a common practice, the amount of gratuities can differ by the type of establishment. Here are the most typical service people you will encounter in the Big Apple, together with how much to give. In New York, most service workers rely heavily on tips to make a decent living because they are paid very low base wages, especially in areas that do not attract a lot of business. There are many things to consider when deciding how much to tip, such as whether the place is a luxury establishment or not, the quality of the service, etc., but the one thing you should always remember is to tip service staff. That said, here are some typical service establishments you are likely going to encounter in New York and a few guidelines on tipping their employees. Tip bellhops at least $2 for each bag, especially if you are in a luxury hotel. Add $1 per bag in addition to the first one. Chambermaids are generally given $3 to $5 in tips for each night of your stay. Some would tip each day, whereas some choose to pay a lump sum at the end of their stay. However, some experienced travelers suggest that you tip the maid on the first day to guarantee great service the rest of your stay there. If room service is not yet included in your bill, add it as a tip of 15% of the total bill. 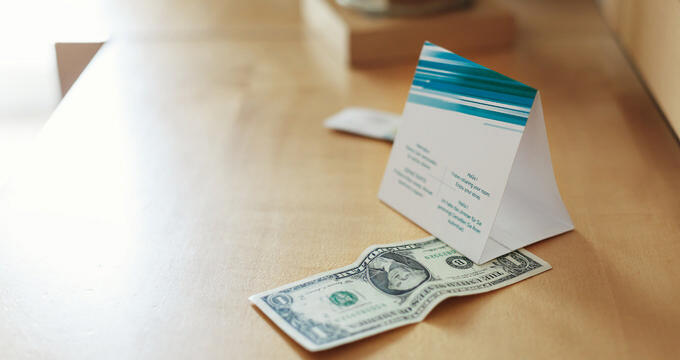 Concierges, just like in other countries, are typically not tipped, but guests commonly give concierges $1 to $5, especially if they were able to give you exceptional service or hard-to-book reservations and the like. In restaurants and similar places, tips are commonly split among the employees, including busboys and waitstaff who did not serve your table. Some restaurants automatically add gratuity to the bill for groups of at least 6 people. Always check your bill before leaving a tip. Take note that more and more restaurants nowadays do not allow tipping. They typically increase menu item prices or tack a certain tip percentage on the bill by default already and use the added funds to increase their workers’ pay. When there is no such policy, here are some standard tip amounts. Coatroom attendants are tipped at least $1 per coat. Servers are typically given 15% to 20% of the total bill as tips. In high-end restaurants, 20% is likely the standard. In bars, patrons generally tip $1 per drink. However, for expensive or difficult drinks, you may want to add more. When buying 5 drinks at a time, a $3 is fair. Meanwhile, cocktail waiters and waitresses are commonly given $1 to $2 in tips per drink. For wine stewards or sommeliers, the tip is generally 15% of the bottle’s price. In buffets, servers are given at least $1 per person in tips if they do not serve the drinks. If they do, then tip them 10% to 20% of the total bill. This may be adjusted on the basis of service quality. Cab drivers are typically given 15% to 20% of the overall bill in tips, but you may want to give more if they have been particularly helpful, carrying your luggage, sharing information about attractions, hotels, and restaurants, or translating for you. Pay tips in cash even if your taxi has a credit card reader. Drivers are typically charged for credit card tips. Finally, a tip of $2 to $5 per head is common for shuttle drivers. Spa attendants and hairstylists are commonly tipped 15% to 25% of the total bill, in cash. Tour guides are generally given $5 for each person in a group, but it can vary a lot according to the group size and tour length. New York is one of those places where tipping is not legally mandated but it might as well be. Tipping is so common in the Big Apple that not leaving a tip is frowned upon. You are expected to tip each time even if the service is bad (You can give the minimum, though, of around 10% of the total bill if you are not satisfied.). So always have some tip money ready.